Journalism in Context is an accessible introduction to the theory and practice of journalism in a changing world. The book looks at the way in which power flows through media organisations influencing not only what journalists choose to present to their audiences but how they present it and then in turn what their audiences do with it. Using examples from across the world, as well as from her own research, Angela Phillips uses them to explain complex theoretical concepts. She invites readers to consider how news is influenced by the culture from which it emerges, as well as the way it is paid for and how different countries have approached the problem of ensuring that democracy is served by its media, rather than being undermined by it. Journalism has always been an early adopter of new technologies and the most recent changes are examined in the light of a history in which, although platforms keep on changing, journalism always survives. The questions raised here are important for all students of journalism and all those who believe that journalism matters. "This is the book that so many journalists and engaged observers of news media have been waiting for. Journalism in Context seamlessly interweaves theory and practice, and in so doing, brilliantly succeeds in bridging the worlds of professional journalism and academia. In clear and cogent language, amply illustrated with interviews and real-world examples, Phillips opens up new ways of understanding and improving contemporary journalism at a moment of crisis." 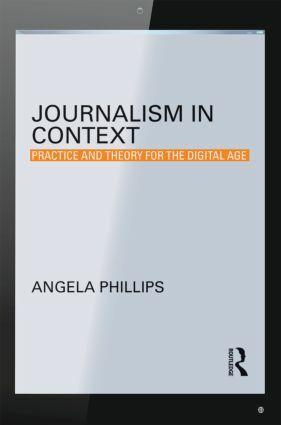 "Angela Phillips deftly considers the roles of flesh-and-blood journalists within the context of the structural factors that influence how journalism is practised. Not only does this stimulating book help us understand what’s going on in journalism, it challenges us to find ways of making it better – because journalism matters." "Accessible and analytical, this is an admirable book that makes a valuable addition to the academic study of journalism and one which should be widely read by both students and journalists." "This interesting volume provides a European perspective—which is welcome after more than a decade of the frankly boring…Silicon Valley claims for progress in the digital age…[and] offers fresh evidence for widely known trends, including the sloppiness of blogs and audience-generated content (fringe is a good term here) in contrast with the reliability of print… Summing Up: Recommended. Lower-division undergraduates and above; general readers." Angela Phillips is Professor in Journalism in the Department of Media and Communications, Goldsmiths, University of London. She spent the majority of her career as a journalist working for national newspapers, magazines, TV and radio. She is the author of Good Writing for Journalists (2006) and co-author of Changing Journalism (2011).